JBrickBuilder’s GUI is pretty well laid out and visually appealing. There’s plenty of room in the center to work on your model. Hovering over the icons lets you know what they do and there aren’t very many options or additional menus. Models don’t look as nice though, as you can see in the screenshot below. 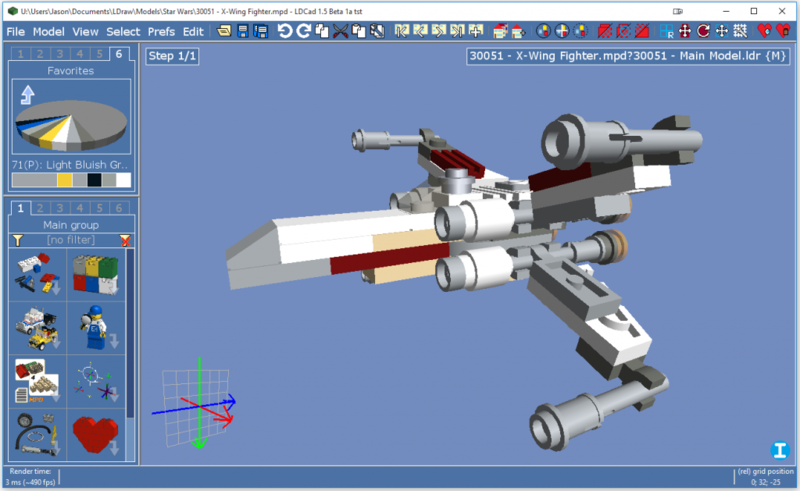 It takes longer for JBrickBuilder to load models than the other programs. I didn’t like that it would scroll files sideways, I’m used to them scrolling up and down, so this took some getting used to. 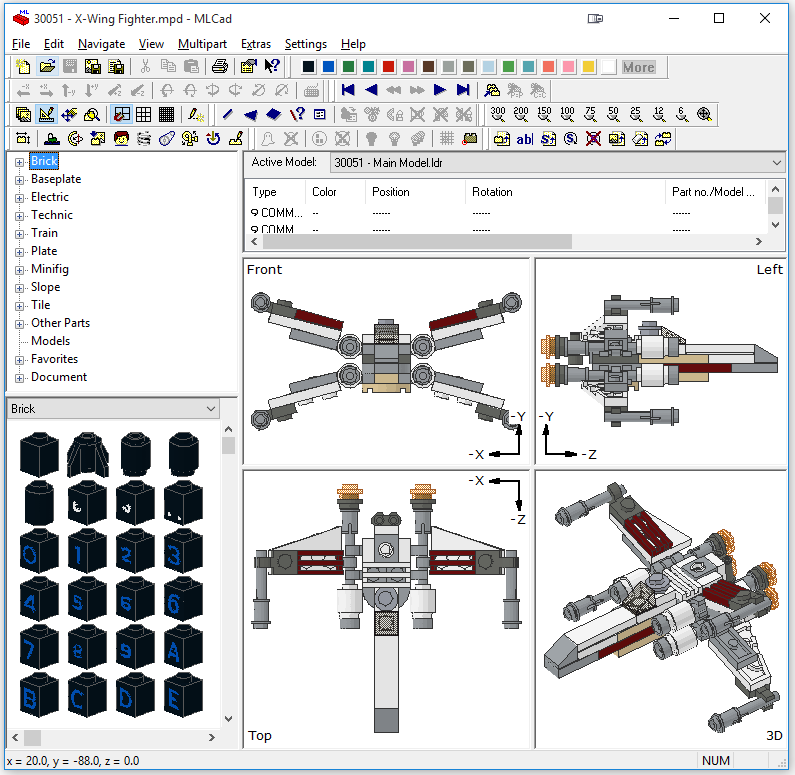 When you first start / see the main LDCad GUI / interface you probably notice it’s quite different from most modern CAD programs. There are multiple personal and technical reasons, I won’t go into here, for this though. Anyhow don’t let the ‘oldschool’ look fool you, just take the time to get used to it and you might just love it. What I like about it is that parts and colors are really easy to access and there’s plenty of room to work. I liked the blue background, it was pretty easy on the eyes and parts were pretty easy to pick out. One thing that I thought could be improved were the icons. You can customize those if they really bother you though. Also, when you hover over the icons, you don’t get a little pop-up to tell you what they do, you have to look down at the bottom bar to see what they do (eyes have to travel a lot, especially if you have a big screen). I got used to it, but it’s not as efficient as having a little pop-up (I think those might be in the works though). You can actually pin the menu if you want, and you can even navigate up to the root of the entire menu tree by clicking the little house (home) icon. Also, clicking the little up arrow takes you up/back. It was a little different to get used to, but I think I like it better than having a bunch of slide out menus. Models are rendered really well and look great. AA is enabled in the screenshot above and it makes a little difference in the visual quality of the model. There aren’t many options to choose from, just what you need to build. Hovering over the icons on the top will tell you what they are, and selecting one sometimes presents more options (just below them). To some extent, I think some of the icons could have been a little smaller to make a little more room for building. Not that the build area is small. 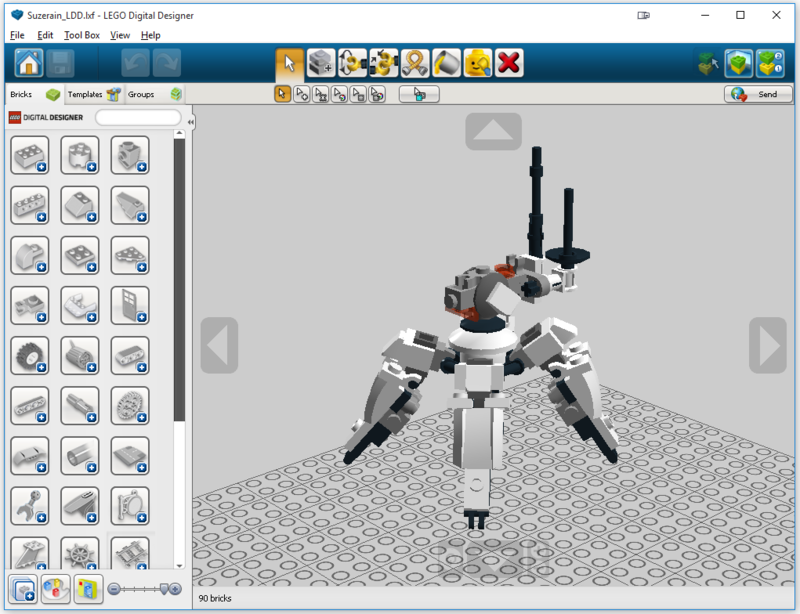 You can also hide the part menu to give you an even bigger build area (but then how do you get to the parts? :)). Don’t forget to check out the icons at the bottom of the part bin, they can quickly close all the categories, or filter by a specific color and cut down on all the clutter. Models are rendered really well and look great. 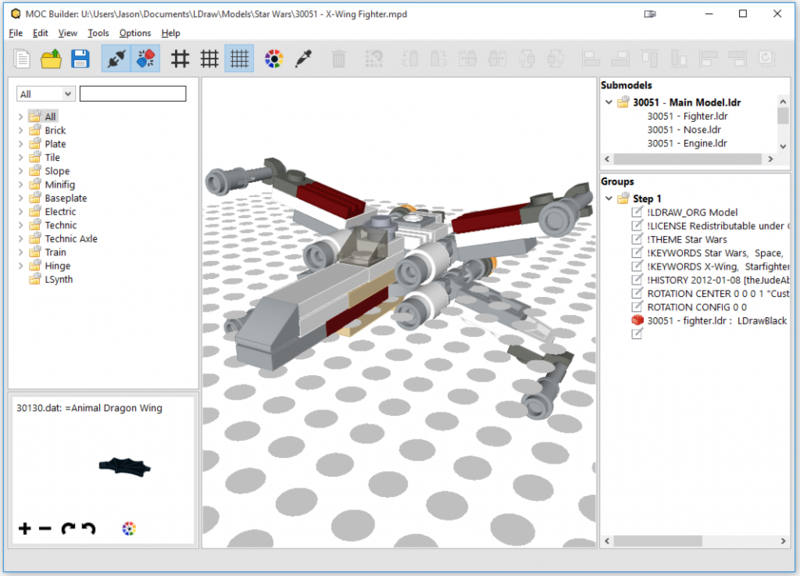 LeoCAD’s GUI puts the tools you’ll probably use most front and center. It’s a pretty clean look and I like the icons. There are quite a few more options that you can get to by going through the other menus. 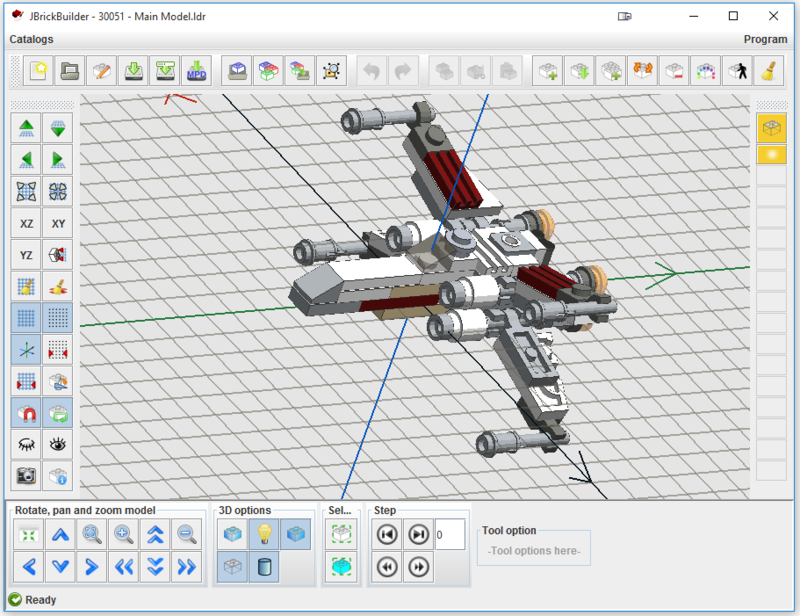 MLCad’s GUI looks a little dated to me. When I first opened it up the tool bars were all spread out and there was a lot of unused space. You can re-arrange them to take up a lot less space, and even remove the ones you don’t want. However, it does a pretty good job of putting the stuff you use most often front and center. And, although the icons look a little dated, they do a pretty good job of conveying what each one does. If ever in doubt, you can hover over one and it will tell you what it does. The part bin works pretty well, however, having the view split 4-ways makes building a little cramped. 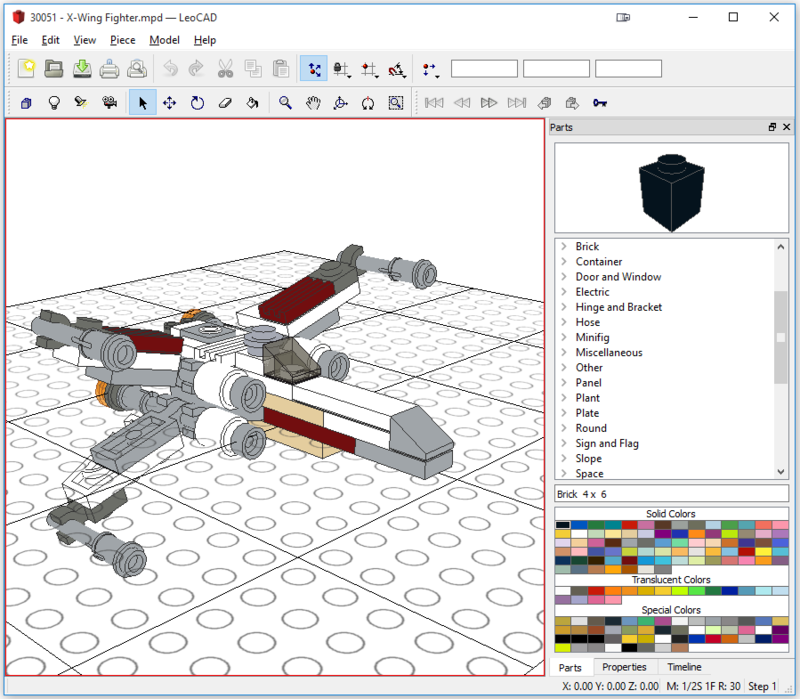 I didn’t do a lot of building in MLCad, but I can see that if you were working on larger models it might be hard to see everything, even with being able to adjust the different views. You can drag the center all the way to a corner to make one view take up the entire build area, but you kind of need them all to correctly line up parts since they don’t automatically snap into place. Models don’t look bad, but they don’t look great either. MOC Builder’s GUI was 2’d to LDD’s in simplicity. Even though there are additional menus, the options are pretty sparse. The icons are nice and descriptive, probably my favorite out of the bunch. They could probably be a little smaller to free up a little more real estate for building. There aren’t very many icons because most of what needs to be done can be done with the mouse or through visual queues when you select parts. You can re-size the areas to the left and right of the build area, but I didn’t see a way to completely hide them (other than dragging the inside edge all the way to the outside edge). By default, this makes the build area feel a little cramped. 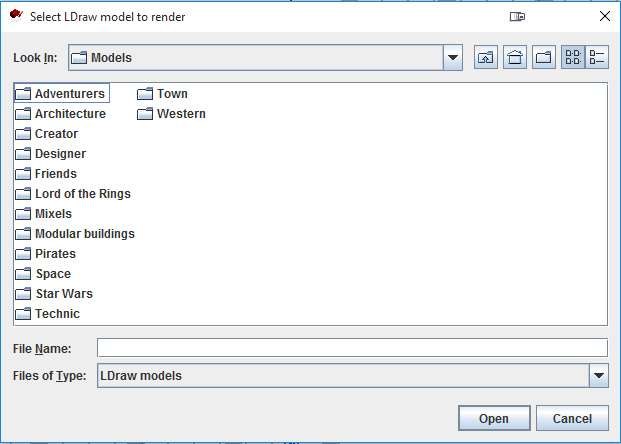 Models look really good, probably the best out of all of the programs I looked at. 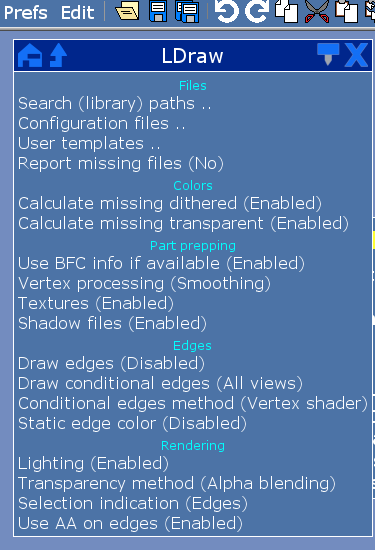 SR 3D Builder’s GUI was pretty standard. The icons were OK, but a little small. It was a little hard to tell what some of them actually did without hovering over them to find out. A nice touch is that the Toolbox is detached from the main window and you can put it anywhere you want and re-size it. So, if you have multiple monitors you can put the Toolbox on one and have a nice big build space on the other. Drum roll…there isn’t one. Even thought I don’t go into thorough detail about each one I think you can see that there are good things about all of them. Mostly, I included this section to give others an idea of what each one looks like without having to install the program. So, there you have it. Which GUI do you prefer?